CSU leader Horst Seehofer has long pressed Chancellor Merkel to set a hard cap on the number of migrants Germany takes in, to block those with no genuine claim to refugee status, and to help genuine cases in their home countries rather than Germany wherever possible. Mrs Merkel has resisted Seehofer’s overtures until recently — but, struggling to form a government after her disastrous election performance in 2017, genuine conservatives like Seehofer are now able to exercise more influence. He has already pledged to block any coalition with the Social Democrats if it includes a migrant family unification deal, which could pave the way for “overwhelming” chain migration. “In previous years, I have asked whether it will be possible for us to assert the will of the people,” Orbán told his hosts. “In Europe, leading politicians in many places have not done what the people wanted. This is a violation of democratic principles and this conflict must be resolved. The Hungarian described how his country refused to bow to pressure from the European Union, Soros-funded open borders campaigns, and other forces pressuring it to accept mass migration: “Right from the beginning we have stood for the protection of the borders … We built a fence, and reinforced our border controls when there were places in Europe where chaos and illegality were being celebrated,” he said — a barely veiled dig at Mrs Merkel. “The people’s will is clear: the people do not want to live under the threat of terrorism, they want security, they want their borders to be protected, and they want their leaders to take those people out of [Europe] who have no reason to be there,” he warned. 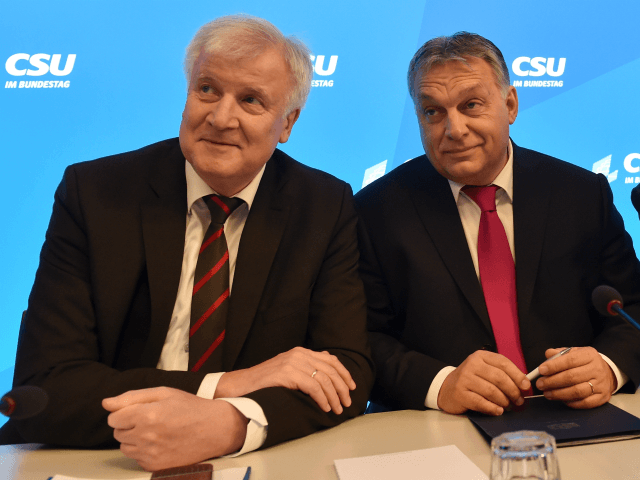 Seehofer last invited Prime Minister Orbán to Bavaria when the migrant crisis was at its height in 2015, when the Hungarian slammed Chancellor Merkel for “moral imperialism” and pledged to serve as “captain of Bavaria’s border guard” by acting decisively to protect his own frontiers. Orbán reiterated that pledge once more on his latest visit, and then as now his presence has been interpreted as the CSU firing a shot across the bows of Chancellor Merkel — particularly as she heads into her latest round of coalition talks. Inevitably, Seehofer received criticism for hosting the Hungarian leader — but the Bavarian insisted it was important to maintain good relations with “all the small countries of central and eastern Europe”, and warned Germany should be “less arrogant” in “judging” its conservative neighbours. Indeed, the veteran statesman said he wanted Bavaria to play its part in a “central European alliance” — referring to the conservative, anti-mass migration bloc of Hungary, Poland, Czechia, and Slovakia, which may now be joined by Austria under its new conservative-nationalist coalition government — and pointed out that Germany’s eastern neighbours are bigging trading partners for Bavaria than France and Britain, in Europe’s multicultural west. “Without a doubt [Prime Minister Orbán] stands upon ground made up of the rule of law,” he declared — a clear rebuke to the Brussels establishment which has hounded the Hungarian for robust border policy and refusal to submit to the EU’s policy of compulsory migrant quotas.